A big thankyou to Ultimate English who sent me some products from their lovely toffees and fudges range to review recently! Ultimate English are a company based in Harrogate, Yorkshire producing hand-made fudge and toffee in the traditional English way. They describe their fudge as "The grandest butter fudge in the world", which is quite the claim...luckily I can say they may just live up to it! This fudge was simply divine! The texture was firm and crumbly, and although I generally prefer softer fudges like Thorntons, this was pretty amazing. It tasted extremely buttery, with a moreish golden syrup and brown sugar flavour. It melted in mouth and tasted heavenly...it was mega sweet of course, but so nice I accidentally ate too much at once! A new Kitkat flavour is always a "big thing" in my opinion, considering it's the biggest selling chocolate bar in the world. Nestlé UK have been quite busy with the Kitkat brand recently, launching a new Kitkat Chunky Double Caramel, and also this new toffee variety in the multi-pack range found in the biscuit aisle. At first I thought this would simply consist of toffee flavoured wafer, but turns out it actually has a toffee flavoured coating! It's kind of similar to the Kitkat Caramac they did years ago, but this one has two layers: one of toffee flavoured white & dark chocolate, and a base layer of milk chocolate. Opening the wrapper, the bars had a very strong toffee aroma...I could tell this was going to be sweet! Unlike the 4-finger and Chunky Kitkats, this 2-bar version has retained the much-loved foil wrapper, and I have to applaud Nestlé for this as it looks quite grand with the light glistening off it! It's not often we get a new Bounty variety in the UK....in fact, outside of import stores I've never seen anything different from the Milk and Dark chocolate versions. So when I spotted this "Noir" with 75% cocoa solids recently I just had to pick one up! They were on offer of 3 for a pound, which is a great bargain, although they were a little past the best before date...boo! The only other Bounty variety I can remember ever trying was a Mango flavour, way back in around 2004. Sadly it was an import and only available in discount stores. Some countries also get a Cherry Bounty...now that's one I'd like to see in the UK! This one appears to be made in France and imported by Mars Canada, then shipped over to the UK...confusing! Opening the wrapper the first thing I noticed was that the chocolate looked a lot darker than the "Dark" Bounty we get in the UK. Last year, Magnum UK brought out a new countline chocolate...or rather, three mini chocolates in a countline wrapper. I was skeptical whether they would stick around to be honest, but it seems they must have been popular as they've now added a caramel variety to the range. Like the original variety this contains "a vanilla flavoured white chocolate truffle filling", and is complimented with a layer of firm caramel running above it. They're like mini versions of caramel magnums! As with the original variety the chocolate is rich and good quality, a step above most average chocolate bars. The filling was smooth with a lovely vanilla hinted flavour, and tasted very reminiscent of Magnum ice cream. Which is nice...but a little odd in a chocolate bar. The caramel had a nice buttery flavour and complimented the truffle very well. After much fiddling around with my own blog, I now have the time to sit down and type away at a new guest review & I'm going to attempt to get these up at least once every 10 days or so? Myself and Kev haven't arranged a schedule but I will try my hardest to get some more posts done because I've heard previously that they've been rather popular! 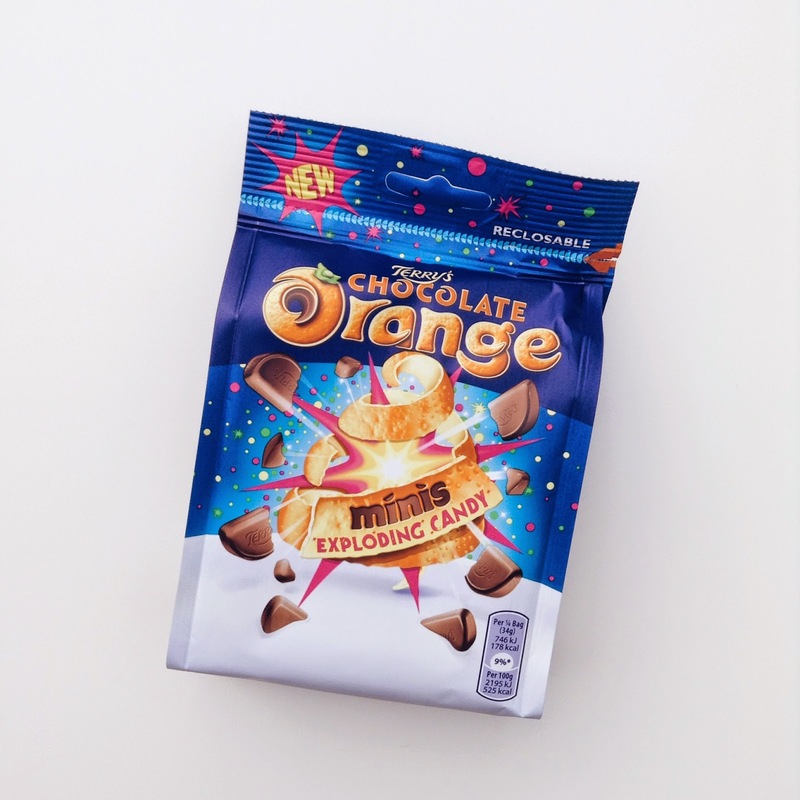 As it's vastly approaching Christmas, Mondelēz tend to launch more Terry's Chocolate Orange products and this year we've got quite a lot of new exciting chocolate orange products including the new Toffee Crunch orange and these - Terry's Chocolate Orange Minis with Exploding Candy. The bar is described as "Chunky milk chocolate with peanuts (25%)" and contains 25% cocoa solids. Opening the wrapper, the first thing I noticed was the intense smell of roasted peanut. It reminded me of the mighty Snickers bar, but with an even more intense peanut aroma. It's split into 5 chunky blocks. Today's review is thanks to one of my kind readers, Vicky, who recently visited Sweden and picked up a new Limited Edition Mint Daim bar for me. We don't usually get limited edition Daim varieties in the UK (although there were briefly some Cola and Orange flavours! ), but a little research reveals there's been lots of Daim limited editions in its native Sweden - Dark and White Chocolate, Forest Fruits "Summer Dream", Lemon-Lime "Cool Breeze", Cappuccino,...and even Daim Ice Cream Bars! Maybe there's no demand for all these things in the UK. What do you think, readers...would you like to see more Daim varieties on shelves? Back to this mint flavour...inevitably, the bar has shattered in the post, which isn't surprising as it's longer than the Daim bars we get in the UK. It smelled intensely of mint, in fact it reminded me of Murray Mints and Mintoes - those butter mints that are often popular with grannies.